Description: BN 2201 is joined by five other models (C424, C425, F3, RS11, and GP9) on a typical late 1970's day at Pasco. 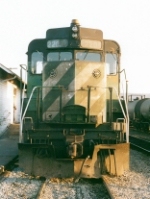 Description: BN 2201 was later wrecked and retired in 1980. Description: A well weathered face of mechanical warrior. Description: A pair of GP30s on the house track at Bellingham. Description: BN train 134 takes the siding at Bow for a meet with 133.